If you take a walk around the Springmoor community, you’re likely to bump into resident Jan Hagarty. As a volunteer in the library, at the convenience store and on the Springmoor Residents Association, she’s often the first person to extend a happy hello to friends, neighbors and visitors. This past Valentine’s Day, Springmoor residents spread the love by hosting their annual food packaging event for Rise Against Hunger, a global hunger relief organization that supplies food and aid to those in need. The senior living community in northwest Raleigh has partnered with the charity for nearly a decade, and it has helped provide more than 400,000 meals for people around the world. Over the past few months, Springmoor residents, staff and family members continuously donated money to purchase supplies and also volunteered for the meal packaging event. This year, the community’s goal was to package 60,000 meals in just a few hours. What do you do when you are out of bread or milk? Most of us run to the grocery store or call a good neighbor. Here at Springmoor, the grocery store and a good neighbor are one in the same! The community of volunteers that run the store are a reward for everyone here. Springmoor residents and husband and wife, Emily Castrodale and Bob McGaffin, have been managing The Little Corner Store, an on-campus convenience store, for the past six and a half years. The store provides a great service for their neighbors at Springmoor. 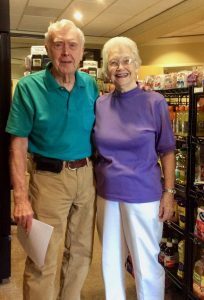 Bob and Emily, along with a long list of volunteers, keep the store stocked with everyday essentials and speciality items. The pricing is the same as what you can find in the nearest grocery store. The first Herald was published in October 1990 on pastel pink paper. “Cut and Paste” was actual cutting and pasting articles. The font was American typewriter. There were a few pieces of hand-drawn art to accompany the single column articles. 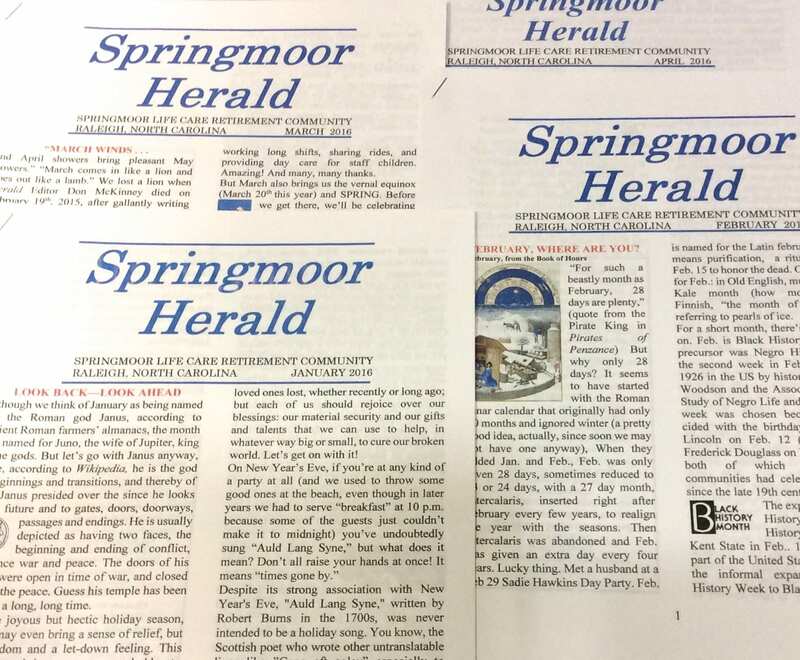 From the beginning to the current edition, the editors along with the technology have quickly changed the look but the content continues to inform our residents and be a well-read newsletter each month. Larry Auld, The Herald’s current volunteer editor, stepped into the position in the fall of 2016. As the former Principal Advisor of the School of Communication and Chair of Library and Information Studies at East Carolina University, he was a perfect to chair this Residents Association Committee. Larry brings with him a background of interests in virtual reality, visual media, history, art, photography, woodworking and gardening. Each new editor has put their stamp on The Herald. Larry uses Microsoft Publisher to put the newsletter together. He has added a number of photos to the publication as photo journalism is an important part of any story. Experimenting with different fonts, he even began to explain the history and origin of each one as he looked for the best type style for the newsletter. 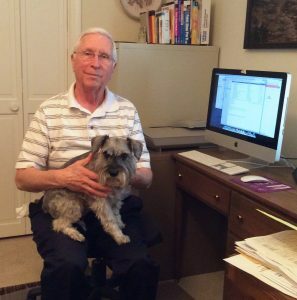 He listens for unique stories in the community as he and Gabby, his little schnauzer, are out and about each day. He is quick to say that he doesn’t put it together without a lot of help from other members of the community. There are many volunteers from the Residents Association who enjoy writing. Suggie Styres, Jan Christensen and Dottie Davis submit articles about newcomers. When a new resident arrives, they are contacted for a get-to-know-you interview. The writers then put together a short article about each new resident for The Herald. 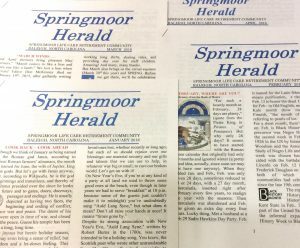 Mary Alice Hale, Springmoor’s Library Chair, keeps everyone informed with updates from the library. Upcoming books for the book clubs are always listed. 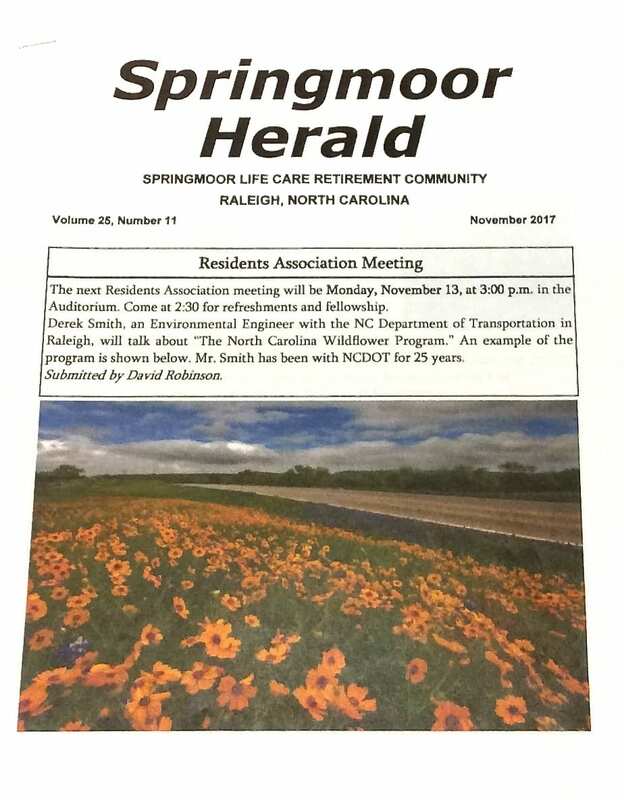 Kari Richie, Springmoor Wellness Director; Leah Willis, Resident Life Director; Thom Morgan, Springmoor’s Landscape Manager and Phyllis Mayo, our Chaplain, also submit articles. The residents and employees are important contributors in keeping up informed of the who’s who and what’s what each month. As with most newspapers, there is a sports section! Game scores are always included. Golf, Croquet, Ping Pong and Shuffleboard are among the many competitive activities that are highlighted each month. Winners are always thrilled to see their winning scores at the top of the list! And not to be forgotten, Bridge players have a column also. Larry quickly realized when he took over as the editor and chair of the committee that the publication had to be completed, printed and in everyone’s mailboxes by the end of each month. For those with birthdays on the first or second of each month, they would be missed if the paper wasn’t in the resident’s hands by the end of the proceeding month. With a smile, Larry says he keeps his editors on a tight deadline so the presses can roll on time. A paper wouldn’t be complete without a little laughter. With each publication, you will find a column or two of puns, sayings or paraprosdokians. I’m supposed to respect my elders, but it’s getting harder and harder to find one now. Did you know there was a garden in the west wing at Springmoor? It’s a surprise to many who don’t walk down this hallway on a daily basis. The Garden Room is a beautiful sunny greenhouse for residents to tend to their plants in the winter months. There is ample counter space where everyone in the community can bring their plants from their patios and porches during the coldest months of the year. Residents Rachel Manning and Audrey Austin have been taking care of everything in the Garden Room for years. Both say they have learned their gardening skills through trial and error. 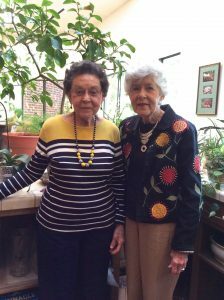 Both ladies say they have always preferred to be outside, playing golf or digging in the dirt. Rachel, a former Master Gardener, can help answer questions about your plants or find someone who can if she doesn’t know. Audrey says her plant knowledge comes from years of experience. When she was young her mother wanted her out of the kitchen, Audrey says. Her mom said she broke too many dishes. She sent her outside to play and it’s there that Audrey learned to garden. She has always had a flower garden and now at Springmoor she has two. In her ground floor apartment, sitting on her patio or looking out the window, she realized she sees more of her neighbor’s yard than her own. She joked with John Pearson, her neighbor, one day saying that she was going to plant flowers in his yard to brighten her view and send him the bill. He laughed and said, “Please do!” And she has ever since. 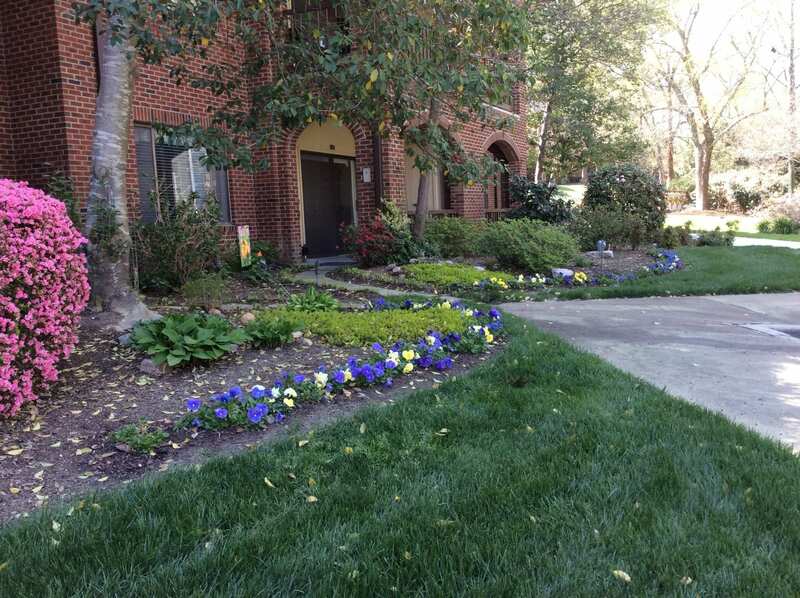 The two yards are filled with rows of her favorite pansies and many other blooming species. And he continues to pay the bill! Red pepper, she says, is the best advice she can offer for keeping the deer and the squirrels from eating the pansies. When they are first planted in the ground, she adds the pepper. For the first three weeks, until the pansies are well established, she goes out each morning to replant them from the animal’s early morning walk through her garden. After a rain or every few days, she adds more pepper. The animals soon realize this is not a good spot for grazing and move on. There is a hawk also, she says, that has helped keep things in order on the north side of the campus. 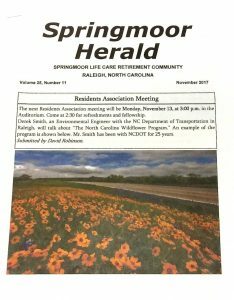 Rachel went through the Wake County Master Gardener program and has volunteered on the Springmoor Building and Grounds committee for many years. 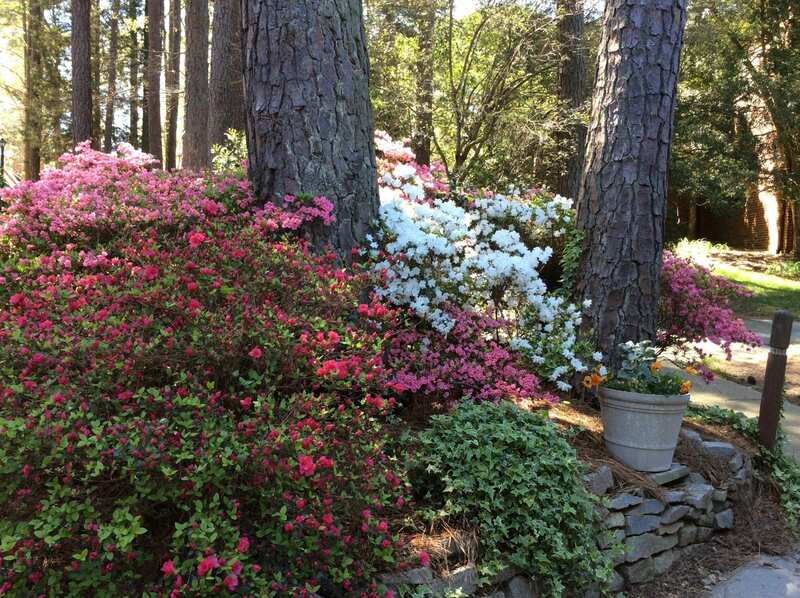 As a Master Gardener, you become part of the volunteer staff of NC State University’s Cooperative Extension Service. A member provides educational assistance and programs in horticulture and environmental issues to the gardening public. Rachel remembers going through the rigorous training program and being interviewed by former Springmoor residents, Bob and Betty Cook. Bob was the Assistant Dean for the College of Agriculture and Life Sciences at NC State University and Betty served as a Home Economics Extension Agent for Wake County. The three later became neighbors at Springmoor and all volunteered with the Building and Grounds Committee. Rachel has a small flower garden now under her balcony. She, along with Kathleen and Jim Perry, have planted a beautiful garden on the path between the villas and the east wing. 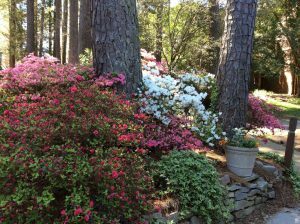 The azaleas, hydrangeas and dogwoods, carefully attended by Rachel along the bank, brighten everyone’s day as they walk through the woods. Rachel has a much larger zinnia garden in South Village during the summer months. 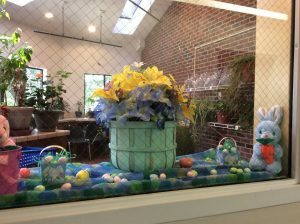 She shares her flowers with those in the Stewart Health Center as well as with her neighbors. She looks forward to planting tomatoes also in her larger garden in just a few weeks. Thom Morgan, Springmoor’s Landscape Architect, not only manages the upkeep of our 42-acre campus but he also helps in the Garden Room and in the Resident Garden. Thom and his crew will help transport the resident’s large plants from the patios to the greenhouse for winter storage. If Rachel and Audrey spot a fungus or a bug on any of the plants, he comes to spray. In the next few weeks, he will till the soil for the thirty resident garden plots located in South Village. He helps provide answers to many questions about indoor and outdoor plants. Rachel and Audrey take turns each month working in the Garden Room. 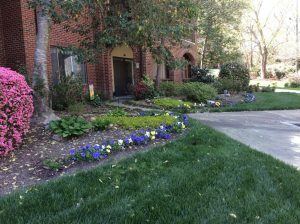 While they are not responsible for watering or pruning all the plants, they will call to remind a resident if theirs needs a little TLC. They watch for bugs and fungus and alert Thom when necessary. 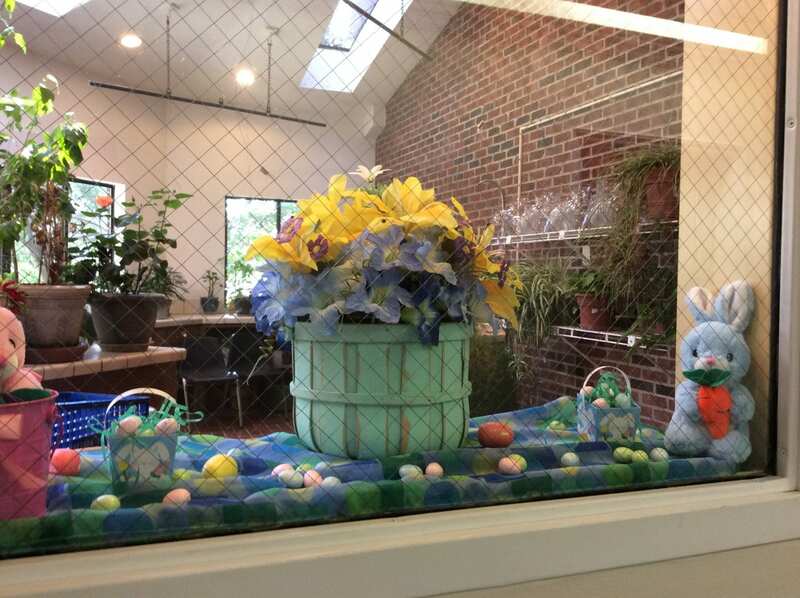 The window overlooking the room is always cheerfully decorated for the season. Rachel was quick to say that, with Audrey’s many years in the classroom, she has lots of decorative items to use for the months when it is her turn.